An anticipated post... Homework Folders! I teach 4th grade on a team with one other teacher. We each have our own "homeroom" class. I teach Language Arts and Social Studies to my homeroom and her homeroom, and she teaches Math and Science to both. It works wonderfully! One of the ways I keep both classes organized is by colors. My classroom colors are mainly turquoise and lime green. So her class is the turquoise class and mine is the lime green. Their book bins coordinate with these class colors, turn in trays, writing trays, notebooks, and finally, homework folders. I wait until August each year when Office Max has their 1 cent deals on 3 prong folders. Depending on the manager (we all know how that works!) I go each day until I have a class set of blue 3 prong folders, and green 3 prong folders... for each of our groups! I also pick up enough sheet protectors to have (2) per student. 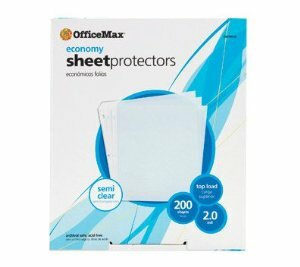 I have 54 students this year, so I picked up a 200 pack of the economy sheet protectors from Office Max. I like to use sheet protectors to house some of the papers because they need to stay in their and stay nice for an entire month. We all know how well that works just sitting in a pocket of a folder! 1.) Many of my students, especially some of my IEP kiddos would either not write their homework down at all, or write it down wrong. This made more work for me because parents wanted me to check their planners each day to make sure they wrote it down correctly. This quickly became a problem when I was trying to pack up 28 fourth graders and sign and check 15 planners. 2.) Students wouldn't do homework because if they didn't write it down, their parents didn't know they had any. 3.) I would have parents initial in the planner that their child read each night, but many parents just scribbled a signature and there was really no follow up or commitment to reading. So I came up with the homework calendars idea. 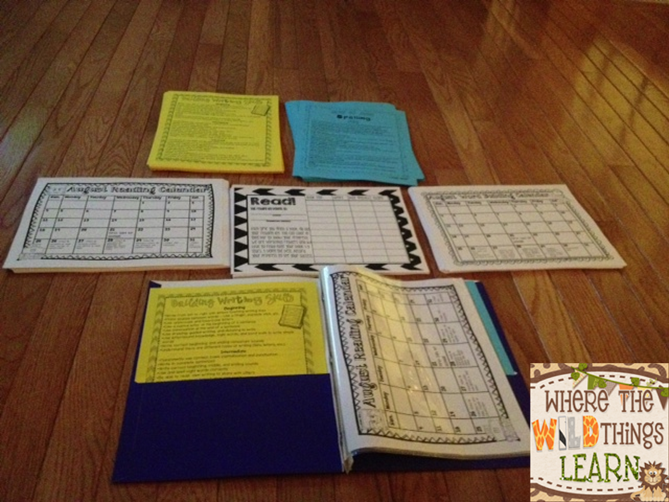 I have changed what I put in the pockets of the folders each year, usually it is something for parents to have extra ideas to work on their students' struggles at home. This year I found this amazing pack from Primary Junction! 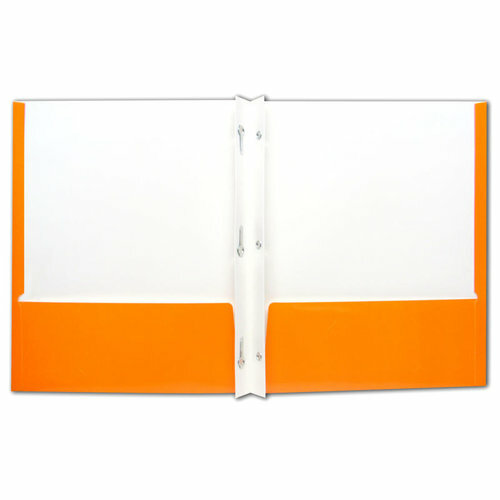 I print the following pages double sided on BRIGHT colored paper and place in each pocket. 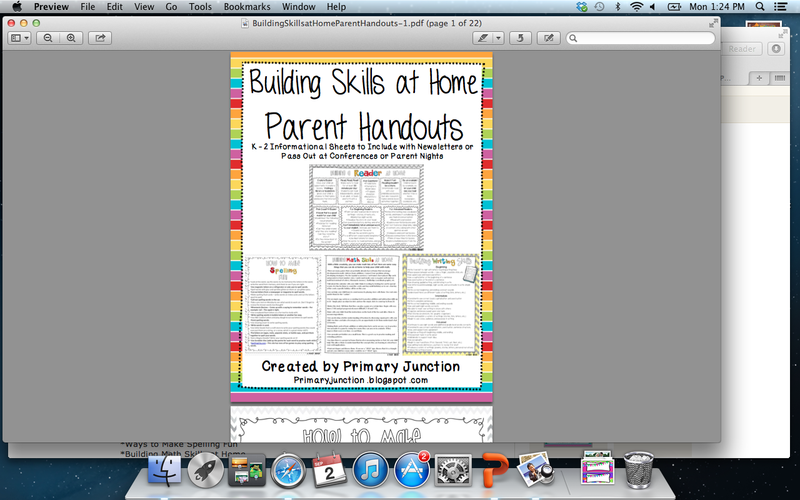 I tell kiddos these are either to stay in their folder, or be posted on their refrigerator. Next, I put (2) sheet protectors in the prongs. 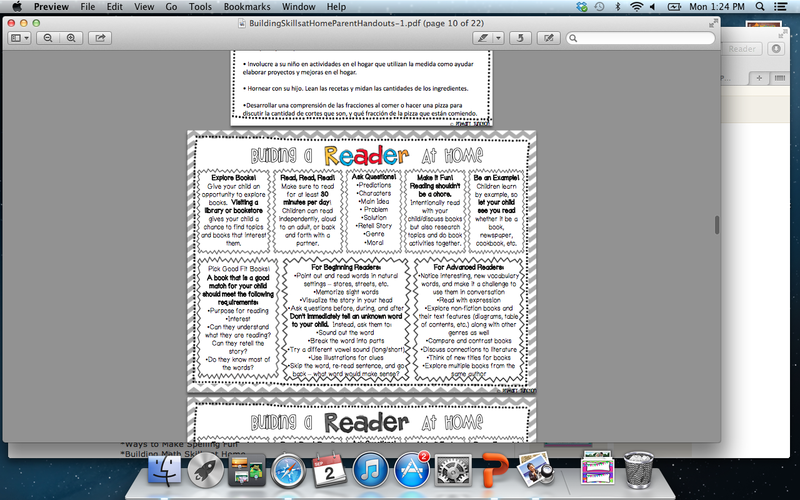 In the first one, I put my Reading Homework Calendar for the month on one side, and my reading book log on the back. Students are required to read for 15 minutes each night, then answer 1-2 questions on a piece of paper or out loud to an adult. 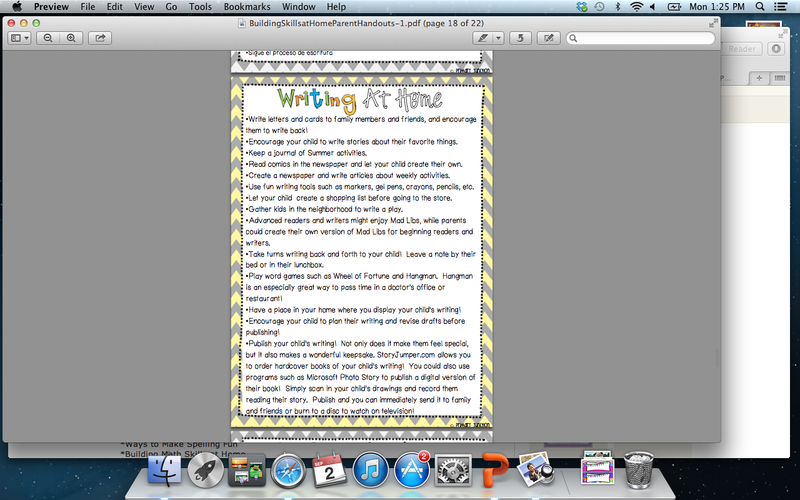 These questions are Common Core essential or standards questions and they go along with my pacing guide. 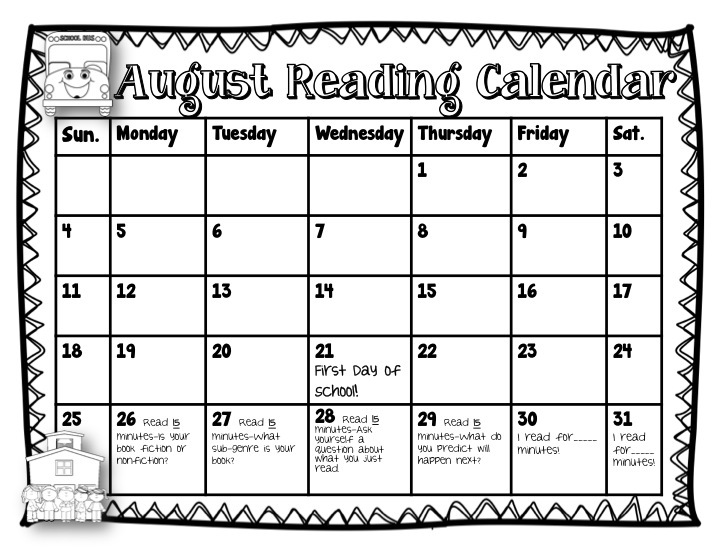 Throughout the year, the calendars will cover all Reading Literature and Informational Standards. I DO NOT collect their answers. I am not a huge proponent of grading homework, which is why I went to this system. Their parents just need to initial that they completed the assignment in the date box. I check these WEEKLY. So on Friday, they need to have 4 signatures for the week. (I do not give homework on weekends.) 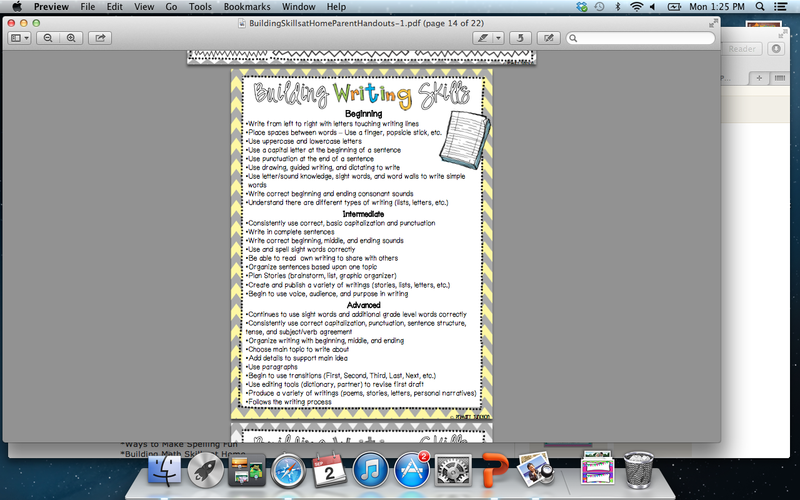 Students can choose to read and record their minutes in the weekend boxes. 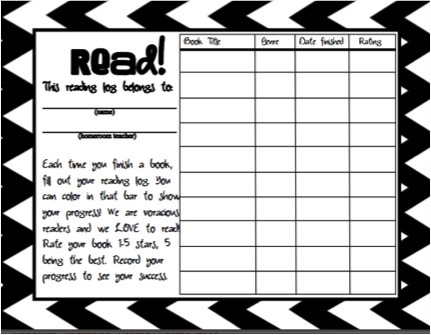 The reading log is used for when they finish a book. They record their book title, the genre, when they finished and they rate the book. I also check these at the end of the week. I put stickers on the Friday box if they have all of their signatures, and on the book log if they finish a book! If students to not complete a day, they stay in from Friday's recess to work on that assignment. Very simple, but very effective so far! 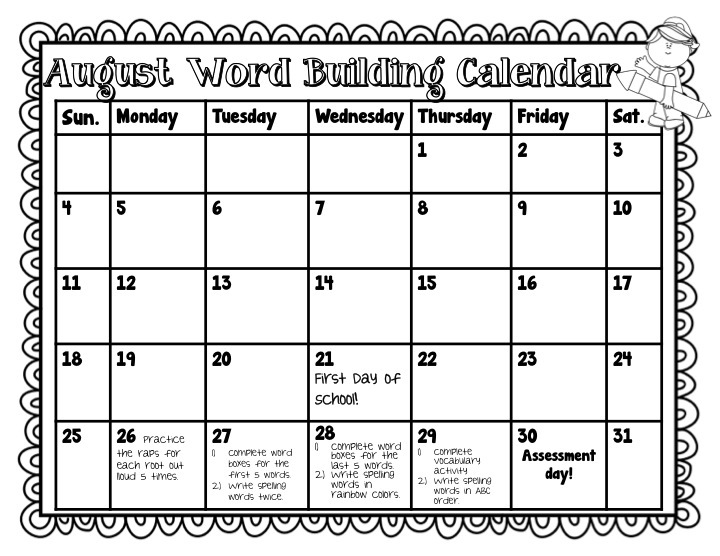 In the next sheet protector, I put their Word Building Homework Calendar. This calendar has two parts. For spelling and vocabulary in my room, I use the Reading Olympians, Warriors, and Trojans programs. 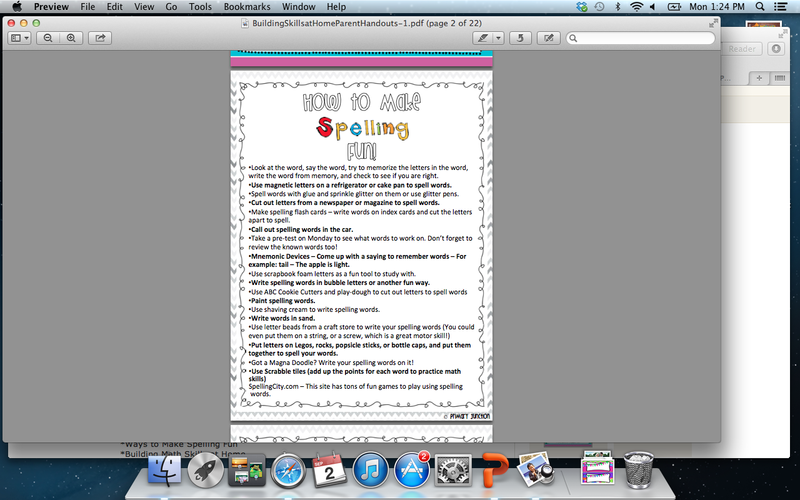 I switched to this last year because I felt that the phonics spelling was not only too easy, but repetitive. I still do phonics during Word Work, but we use the Greek and Latin Roots for spelling and vocabulary. So, you will see my calendars are set up for those packets. We do go over these packets in class, but again, I do not check them each day for a grade or credit. Their parents have to initial that they completed the assignment in the box, and I check it at the end of the week and give a sticker the same way as the reading. They also stay in from recess on Friday for missing an assignment on this calendar. So there you have it! My homework folders! :) They are as simple as that! In case you don't want to follow the curriculum I use, but still like the idea of the calendars, I am also including an editable Powerpoint with the calendars in the product. 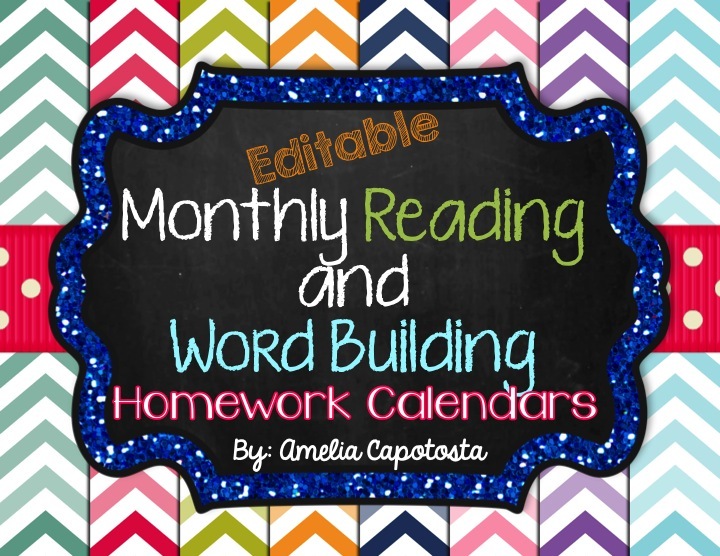 You can add any homework each night you'd like! I hope this helps answer all of your questions. Please let me know if you need to know anything else! Very nice and well organized! Looks like you have it very organized. What a great idea! Thanks for sharing.